Berries, faeries, the rare bontebok and some of the country's finest examples of Cape Dutch architecture can be found in Swellendam, the historic heart of the Overberg. Situated at the foot of the majestic Langeberg Mountain, Swellendam is a popular tourist destination midway between Cape Town and George. Founded by the Dutch East India Company in 1745, it was developed as a thriving centre serving travellers to the interior. Wheelwrights and blacksmiths attended to the needs of travellers and fodder was available for cattle. 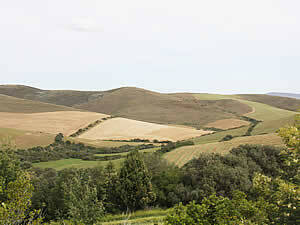 Swellendam has long been an agricultural district and provides a variety of crops, including wheat, other cereals and fruits. Dairy and ostrich farming are also successful in the area. The Hermitage Valley is the largest youngberry producer in the world and you are invited to visit it for some liqueur tasting. Pay the Faerie Sanctuary a visit and have a truly unique experience. The sanctuary is lined with a tangled garden of indigenous trees, plants and herbs. For another exceptional experience you can visit the Bontebok National Park on the Breede River. 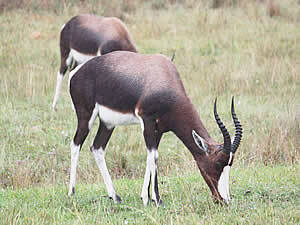 The park is home to the rare and threatened bontebok and coastal renosterveld. A total of 126 bird species can be viewed here. Long ago the site was occupied by the Khoi who raised their sheep and cattle there. Named after a female Khoi captain, 'Lang Elsie's Kraal' is the park's rest camp on the river. Other natural attractions include the Marloth Nature Reserve and Swellendam Hiking Trail. A multitude of watersports, game viewing and other activities are to be had at the Breede River, as well as at the Buffeljags Dam where you also get to sample the region's youngberry liqueur. There are hiking trails in the Marloth Nature Reserve. They traverse the Langeberg Mountains, which can peak at up to 1 500 meters. Fynbos-covered slopes and lower gullies are serviced by cool mountain streams that also nourish indigenous forests. With incredible vistas, waterfalls and rock pools you may be enticed to jump in. The Oefeningshuis on Voortrekker Street, which was built as a church for freed slaves, is at the core of the town's old historic centre. 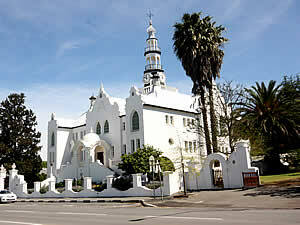 Across the road is the ornate Dutch Reformed Church, open to visitors on weekdays. The old wagon road winds along the main road to the Barry Complex, where goods were off-loaded and includes the Barry Bank and the Manor House, today known as the Auld House. Other charming houses line van Oudtshoorn Street. Swellengrebel Street leads to the Drostdy Museum, renowned for its fine collection of Cape furniture. The complex comprises Cape Dutch buildings and the beautiful Mayville Victorian Garden. The Old Goal in the museum houses a coffee shop, gallery and shop. Behind it is the Ambagswerf with its artefacts and a working water mill where fresh bread is baked on Fridays.